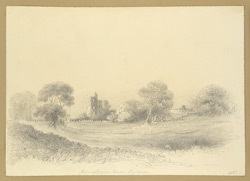 Pencil drawing of the Sat Manzil at Bijapur in Karnataka by Alexander Nash (fl. 1834-1846) dated between 1844 and 1845. This image is from an album of 19 drawings depicting the monuments of Bijapur and the hill forts of Dejouri and Purandhar, made during a Revenue Survey of the Deccan. Nash served with the Bombay Engineers and from 1836 was mainly employed in the Revenue Survey of the Deccan, first as an Assistant and from 1841 as Superintendent. The Sat Manzil or Seven Storied Palace was constructed in 1583 under the patronage of the Muslim Adil Shah dynasty. The structure served as a watchtower overlooking the bastions, the moat surrounds, and the ramparts of the citadel. The palace is now mostly in ruins and only five floors remain. Traces of figures can still be seen on the walls.